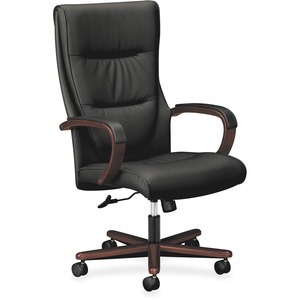 This HON Topflight high-back executive chair features upscale hardwood accents. The waterfall seat edge design, padded upholstered arms, and contoured back covered in black SofThread leather create long-lasting comfort. Seat and back upholstery color is Black, and wood finish is Mahogany.